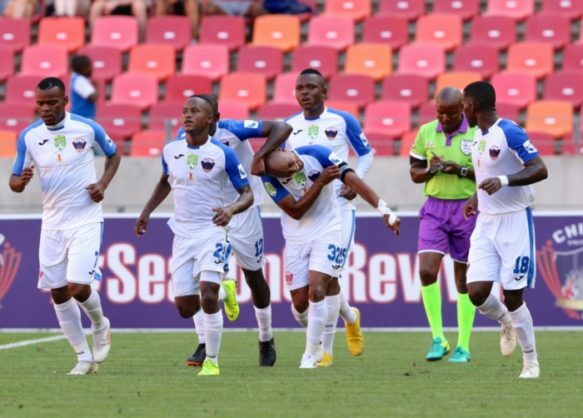 Chippa United ended the weekend above 15th-placed Baroka FC on goal difference after playing to a 1-1 draw with Highlands Park at the Nelson Mandela Bay Stadium on Sunday afternoon. In an evenly-contested affair, the two goals came within two minutes of each other right at the end of the opening stanza, as Sabelo Nyembe put the Lions of the North in front before Lerato Manzini equalised. The first half saw both sides creating chances on goal, although for the most part the goalkeepers were not overly tested as some tame efforts flew in at both ends of the park. Home keeper Mbongeni Mzimela did, however, have some work to do on nine minutes, and he did well to get down smartly to keep out a well-struck effort by Mothobi Mvala. After Chippa had squandered a couple of chances around the half hour mark, Highlands Park began to pose more of a threat in attack and they drew first blood in the 42nd minute when Luckyboy Mokoena’s deflected cross fell kindly for Nyembe, whose shot also took a deflection before ending up in the back of the net. The hosts’ response was swift as they were back on level terms just two minutes later, when Manzini latched onto a rebound after his initial half volley had been beaten away from goal by Highlands keeper Marlon Heugh. The second half went pretty much the same way as the first – both teams enjoying periods of dominance and creating openings, but with a lack of end product. For the Chilli Boys, Andile Mbeyane had a free kick saved by Heugh, while Mark Mayambela scuffed a shot wide from a good position inside the box. In the other box, Mvala went wide with a header and Nyembe failed to hit the target with a shot on the hour mark. The visitors could probably have counted themselves lucky not to have played the final 25 minutes with a man short after Ricardo Williams escaped a second yellow card following a rash challenge on Zitha Macheke. There were a couple of late chances for both teams, the best falling to Peter Shalulile, who fired a volley over the bar from 10-yards out, but once again, there were no real clearcut openings for a winner as the game ended 1-1, a fair reflection of the afternoon’s play.